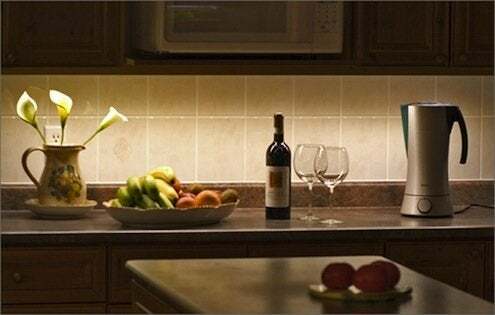 Under-cabinet lighting has come a long way since those old-style humming fluorescents and super hot halogen pucks, with new choices to fit a wide range of budgets and styles. They’re great for providing task lighting for cooks, and they add a dramatic accent to any kitchen. The latest fluorescents are slim and bright, without the blue cast that once made their light tough on the eyes. Most have high and low settings so you can turn them up when you need task lighting and down when you just want a night light. Some models can be plugged into a wall outlet, meaning you can add one almost anywhere without opening a wall or paying an electrician. On the higher end, ultra-thin LED strips virtually disappear under your cabinets and provide clean, bright, even light that makes kitchen preparation tasks a snap. Individual LED pucks can be spaced at custom intervals to achieve exactly the look you want. Some models can be used with a dimmer switch for near-perfect control of your lighting levels.